Download free timing discs to help set up the correct valve and ignition timing on your Matchless motorcycle. When I recently came to reassemble the timing case side of my 1951 G3LS engine I found that the cams and pinion were not ‘correctly’ marked as described in any of the books or manuals. It was therefore necessary for me to check the exact inlet and exhaust valve opening angles manually to ensure that these were correct. 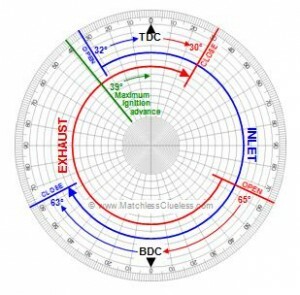 In order to be able to do this I need a timing discs which showed the angles before and after TDC (top dead centre), but as I couldn’t find one suitable for my classic Matchless, I decided to make one up myself. I also added colour segments showing exactly where each valve should open and close to make verifying their angles much easier whilst on my hands and knees at teh side of the bike. The timing disc also then came in very handy again when I can to set the ignition time. Previously I had set the firing point based upon piston position via the spark plug hole, but being able to set it by the exact crank angle is obviously much more accurate. I added marks for the correct ignition timing to the disc alongside the valve timing segments to save needing to remember or read off exact angles when working on the bike. Please ensure that you download the correct timing disc for your model and year of motorcycle as the valve opening and closing angles vary slightly. You can of course check the correct timings for your particular bike by referring to the appropriate Owners Instruction Manual which can also be downloaded free of charge. 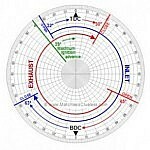 The various versions of the timing disc I have created are available for free download by clicking the appropriate link in the table below. Again, please ensure that you get the correct one for your motorbike. The first timing disc in the list is a generic blank one (i.e. no valve or ignition angles marked) so can be used for any motorcycle. You can draw on the required angles in pen once you have printed the disc out on paper. 1945-1953 350cc and 500cc models. Once you have downloaded the required timing disc, print it out (preferably in colour) at full size on A4 paper. You will then need to stick it onto a cardboard or plastic backing sheet to give it rigidity before cutting round the circular disc. You may also like to have the disc laminated or coat it with sticky-back plastic to make it easier to wipe off oil fingerprints later on. The finished timing disc can then be fixed to the end of the left (clutch side) of the crank shaft of your engine using a sticky fixer, BlueTak, magnet or something similar. You will also need to set-up a pointer to the edge of the disc so that you can read off the required angles. I initially used a piece of thick wire (part of an old metal coat-hanger) which I bent around the rear brake pedal and out to the timing disc. That was a bit too ease to knock so I changed to using a hex key attached to the brake pedal with a magnet (as shown in the photo) but I’m sure you can come up with your own solution. Just make sure it doesn’t move so that the angles you measure and accurate. I think your idea of making up a colour coded timing disc is a great idea. On my Norton neither of the cams has a dimple to help with correct meshing on reassembly. What isn’t clear from your little article is where you attach the disc. If it were attached on the primary drive side of the crank the arrows are backward. However, if it is attached on the timing side won’t it cover the cams that you might need to remesh? 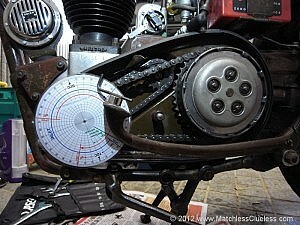 I fitted the timing disc to the primary drive chain side of my Matchless G3, that’s the left side as you sit on the bike (near-side). I stuck it on the end of the drive shaft on top of the shock absorber device using some double-sided tape, with a wire indicator pointer bent round the rear brake pedal. Are you sure the arrows are backwards? It’s been a while now since I used the disc to time my bike, but it all seemed the correct way round from memory! Many thanks for the great website, It’s been a real help. I’m about to re-time the ignition and valves on my 55 G3LS but I don’t understand something I’ve read in the manual and hoped you might be able to shed some light on it? The manual refers to ‘the front plate of the automatic unit’ and to ‘hold it in the fully advanced position’. What is the automatic unit and what is the fully advanced position? I’d really appreciate some help. Check you have the right manual for your year of engine – earlier ones had manual ignition advance and retard via the level on the handlebars, later ones had an automatic advance system built into the ignition. The advance is what makes the spark occur earlier or later depending upon the engine speed. Hope this helps. I’ve got a feeling the arrows are backwards too – not that it matters, it still helped be set up the valve timing on my Matchless. I live on the Prairies of Canada, Province of Manitoba, & am restoring a 1954 Model 20 500cc AJS Twin. HAVE to have something to do in the long, brutal (-30C) winters! Congratulations on a great web site. I have restored a 1953 G80 single and a 1965 G80CSR, previously. Belong to the AJS & Matchless Owners Club of North America. 2 WHEELS MOVE THE SOUL! I’m busy rebuilding a 1964 ex-Rhodesian Police G80 (sometimes called the CSR) and I would be grateful to make email contact to discuss the details of these rare bikes. Hi. Just seen your site about Matchless timing. I thought I was going a bit potty until I read this. My G3LS 1956 does not have the exhaust cam marking at all as shown in the manual. I only noticed this once I had reassembled the timing side and was just playing with the engine, turning it forward, and noticed both valve followers were coming up together! To Lionel Crator, Johannesburg, South Africa. Yes, I will be most grateful to receive the photos you mention. My bike is in pieces, but I believe they’re all here. Your photos will really help. My bike was bought by my late father from a bloke who immigrated to Rustenburg from Bulawayo, many years ago. Lionel Crator and Tom Hesom, I too have an Ex Rhodesian G12 Matchless Police Bike, “63 Model. Now resides in Perth Australia and is just about to be started for the 1st time…once I have figured out James’ method of timing. Would be interesting in communication with you , but do not know your email addresses? You are very welcome to contact me at [email protected], and I look forward to hearing from you. A Matchless G12 from the Rhodesian Police might be very rare. The Police preferred Matchless singles and BSA twins. Hello Lionel. My email is [email protected]. Look forward to sharing stories of G12’s.By the way I also used to own 54 Ajs twin 500. I am an active member of the Antique Motorcycle Club of Manitoba (Canada) Check out our website amcm.ca I am an expat South African and bought this basket case 1965 Matchless G80 500 single ex Rhodesian Police bike in SA before we emigrated, and restored it in Canada. It was featured on the cover of the March/April 2006 issue of the North American AJS & Matchless club’s newsletter. The old Dunlop tyres still had “Made in Rhodesia” stamped on them but unfortunately they had to be replaced. Good luck with your G12. I have just completed a 1954 civilian model 20 500cc AJS Twin. Hello Tom. Sorry it’s been so long in getting back to you. I still have the ills set of Dunlops as well.Made in RHODESIA. My email is [email protected] I look forward to hearing from you. I would be most grateful if you could email me pictures of your G80. I’m busy trying to re-assemble my ex-BSAP G80. May I bother you with the following? Checked the opening time of the old camshafts in the lathe with timing disc at the outer end and dial gauge. To my amazement, opening times measured were about 191 to 200 degrees, this would be 382 to 400 crankshaft degrees, Impossible!! Have you a solution for this problem, or do I have to refit the old camshafts? An answer would be highly apreciated. Hi Ernst. Thanks for your message. Sorry, but it’s been a long time since I looked at cam timings on my bike and I am struggling to re-engage the necessary brain cells! I think this might need to be a question for the collective intelligence of the owners club forum. Sorry! Hello friend I am using your synchronization disk in the restoration of my G80, with the disk placed as in your photo, the motor turns clockwise or counterclockwise? Hello Peter, thank you for your attention, my question is looking at the disk the motor turns clockwise or counterclockwise.